Wooden Cabins - Who Has The UK’s Best Wooden Cabins? 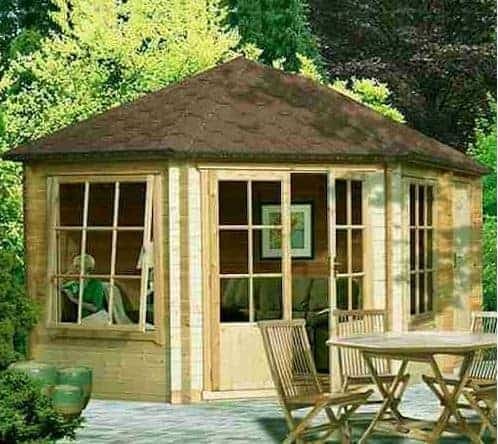 Wooden cabins can be the perfect addition to your garden, and the very best cabins are not only attractive garden buildings but very versatile as well. 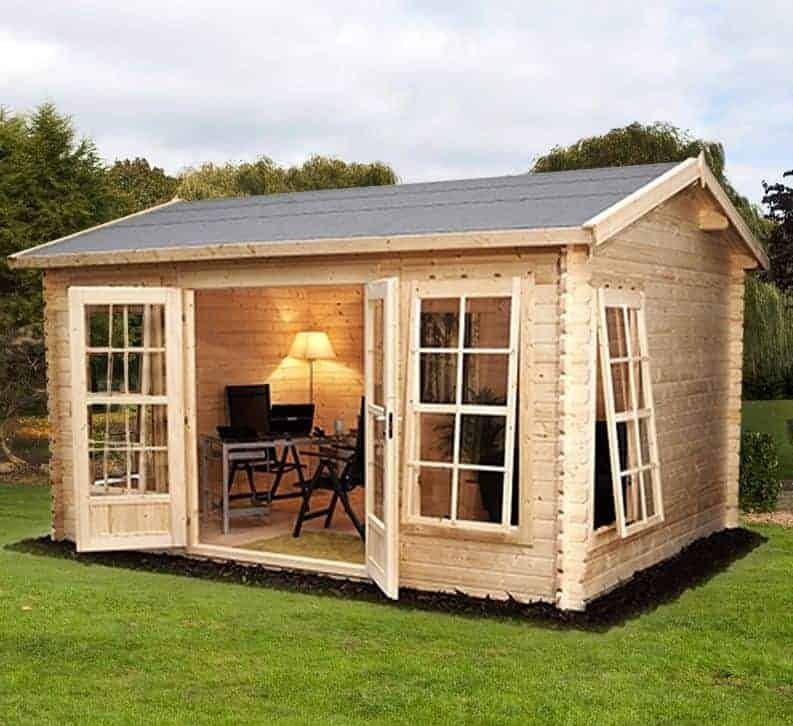 Spacious and durable, they can be used as a strong, sturdy alternative to a garden shed, or alternatively they can be used as an office or workshop, or as a place to relax after a day’s gardening or work, or even a place in which to entertain guests. With so many high quality log cabins to choose from, WhatShed have created this handy guide to help you find the best log cabins that can be bought online in the UK today. With so many wooden cabins to select from, finding the our top twenty was a tough task. We then ranked them based upon factors such as cost and value for money, aesthetic appeal, and value adding features such as extended warranties. When creating this league table, we first had to define what wooden cabins actually were. We decided that they must feature interlocking log cladding, or extra thick tongue and groove cladding; we next decided that they needn’t necessarily confirm to any particular size, so this freed us of the constraints that we would apply to garden cabins for example. 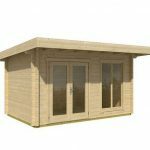 With such a variety of cabins to choose from, we’re pleased to have found twenty very high quality examples that should suit all budgets and all sizes of garden. In such a competitive category, we give special praise to the Alpine Aspen Plus log cabin. 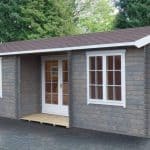 Thanks to its long warranty period, attractive looks and excellent value for money, it earns its place at the very top of our list of the best wooden cabins that can be purchased online in the UK today. Whether you’re looking for log cabins, metal garages, or anything in between, WhatShed bring you independent reviews that can help you make a wise garden building purchase. One of the things we love most about wooden cabins, is the way that they combine visual appeal with immense practicality, and these two qualities demonstrated perfectly by Alpine Aspen Plus log cabin. It caught our eye for all the right reasons from the first moment that we saw it, thanks to its attractive five sided design that’s made even more striking by the use of chalet connectors on the corners. It also represents exceptional value for money for such a spacious building, and with so much room inside and lots of natural light from the two windows and glazed doors, we can easily imagine this being used as a home office, or maybe as a games room or sauna. With a ten year warranty as well, this more than deserves its position at the very top of our league table. One other feature which differentiates this from most of its competitors is that it has a separate and secure storage area, which can be accessed via its own door. We particularly liked the fact that this area has no windows looking into it, and that the door has a key operated lock, as does the main double door entrance. It makes this an ideal environment for storing items of value, away from the threat of prying eyes. These are among the largest wooden cabins to earn a place in our league table, with a base area of 4.85 x 4.85m. That means they can be used either as a storeroom for gardening tools and equipment, an office in which to work, or maybe as a leisure room with the addition of a sauna or gym equipment. Of course, it’s large enough to be used for all these purposes and more, which is why even though it comes with a relatively high price tag of approaching four thousand pounds. What impressed us most of all about these wooden cabins is that all of the timbers have been subjected to an initial pressure treatment; this gives them long lasting protection against rot as well as a very reassuring 15 year guarantee. 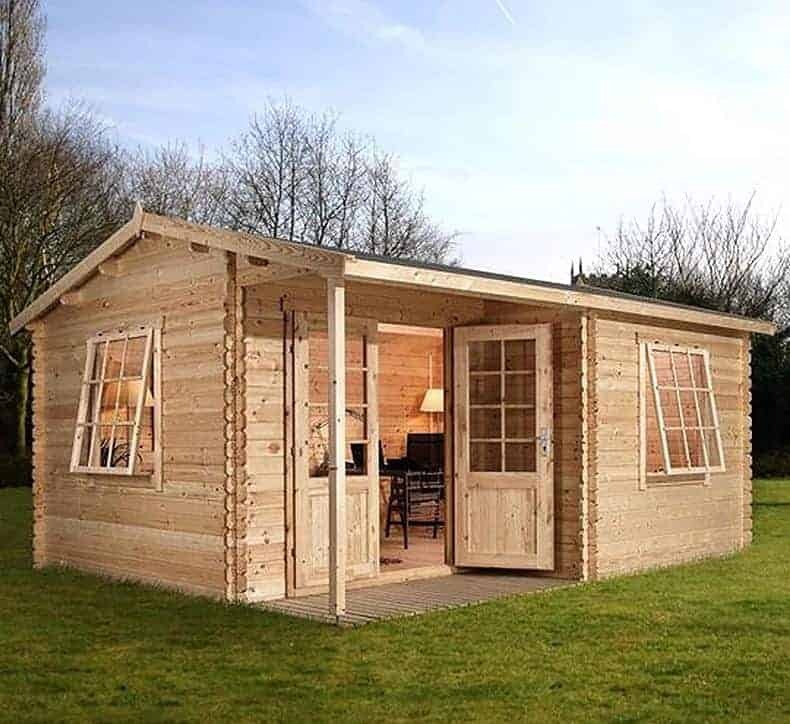 This is longer than we’ve found on any other wooden cabins that we’ve reviewed, and as it also means that the logs won’t have to be treated on an annual basis, which can be a time consuming and costly procedure on a building of this size, this is enough to earn second place in our league table. 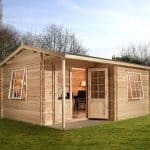 Whilst it may be a little on the pricey side for some, if you want a strong and durable log cabin and have a budget to match the asking price, then this should be added to your shortlist. 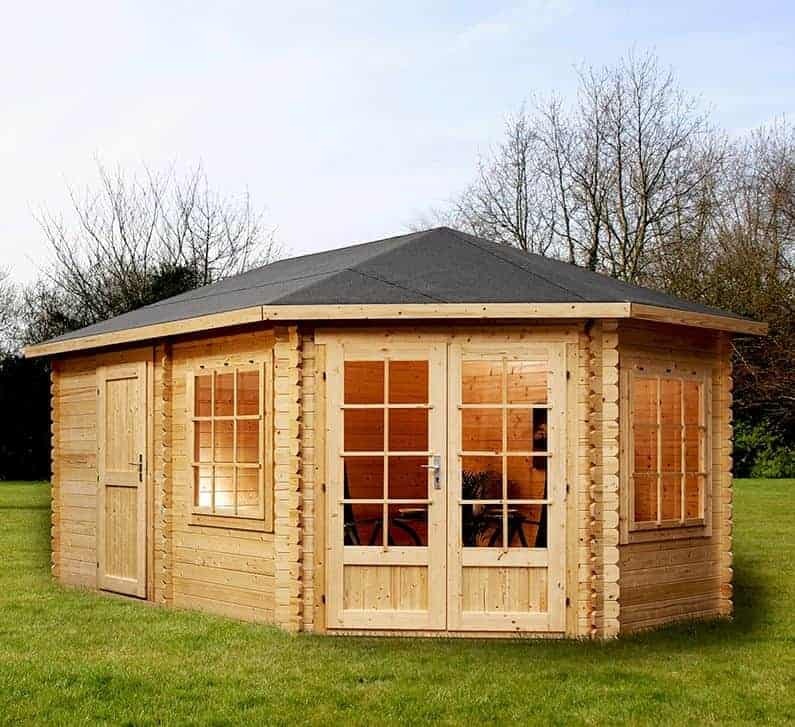 These wooden cabins from Rowlinson feature the high quality components that we’ve come to expect from this manufacturer of high quality garden buildings. It also features a design unlike any other log cabin in this top twenty league table, so it’s a great choice if you want a cabin that’s unique, and that will attract envious glances from your friends and neighbours. In effect, this is a cabin of two halves. One half is a fully enclosed garden building in its own right, while the adjacent half is open fronted with a louvred panel for a side wall. The effect is visually striking, and it gives owners the chance to dine al fresco whilst still being covered by a pent style room. The cabin’s room is accessed by double doors, and what we liked most about them was that each door has a hemispherical window, so that when the doors are closed it creates the effect of one large circular window. It’s another stylistic flourish that makes these wooden cabins a garden feature in their own right. The base area is 4.92 x 2.46m, so there’s more than enough room for either storage or working purposes, and we were pleased to see that even though 19mm thick tongue and groove timber cladding is used, rather than traditional logs, it was still covered by a reassuring 10 year guarantee. The Shire Bradley wooden cabins are among the smallest in our top twenty league table, with a base area of 2.99 x 2.99m or a little more than ten feet square. This in itself can be an advantage, however, to those who want the stability and reliability that a log clad cabin can bring, but don’t have a lot of space on their lawn on which to accommodate one. It’s also by far the cheapest of the wooden cabins in our list, with a highly affordable price tag of less than eight hundred and fifty pounds, and it’s this that accounts for its lofty position. The tongue and groove logs of these wooden cabins fit tightly together, and so keep rainwater out. This is also helped by the apex roof which has a generous ridge height of 2.39m. This also helps in the fight against rot, as rainwater is quickly carried away, and we were pleased to see this recognised in the form of a ten year manufacturer’s guarantee, even though this is dependent upon annual wood preserver treatments being kept up. We were also pleased to see toughened glass being used in the single opening window, a sign of quality and adding peace of mind if you’re likely to have children playing in and around your cabin. This is among the largest of all the wooden cabins to earn a place within our WhatShed league table, and we can imagine just how roomy the interior will feel thanks to its base width of 6.00m and a base depth of 5.00m. We were pleased to find that despite its size it still feels solid and reliable too once assembly has been completed, and that’s because it utilises thick and strong 44mm interlocking logs. Extra strength and protection is offered by the chalet connectors, which not only add to what is already a very attractive garden building, they help to channel winds away. What made these wooden cabins stand out from the others that we’ve reviewed, in addition to their size of course, is that they feature an integrated corner porch area. This is covered by the roof and also has a tongue and groove floor, so it’s an ideal place to stand and share a glass of wine with a loved one as you look out at the garden. The floor itself is raised from the ground by pressure treated floor joists, which we were very pleased to see as it helps to keep the threat of rot from ground moisture away. It’s one of the reasons that the manufacturer can provide a 10 year anti-rot guarantee. We always like the look of alpine style wooden cabins, and once again we found that this model is both strong and stylish. It has a reverse apex aspect, which means that it’s a good choice for gardens that are wide but may not have a lot of depth to spare. This is demonstrated by the base width of 4.00m and a base depth of 3.00m. It also creates a very eye catching frontage, and we were especially struck by the double doors which are centrally positioned and glazed in a Georgian style. It’s a very luxurious looking log cabin, and yet it represents what we feel is very good value for money with a price tag of less than two and a half thousand pounds. This combination of visual appeal and a relatively low price earns it a place in the top half of our league table. We were pleased to find that these wooden cabins come with pressure treated floor joists as standard, as these are a vital ally in the fight against ground moisture. It also helps to explain how the manufacturer is able to provide a ten year warranty against rot, which is something we always welcome but don’t always see, even on more expensive wooden cabins. These large wooden cabins can be a perfect purchase if you often hold dinner parties or have guests staying at your house, thanks to their generous dimensions of 4.22 x 4.72m and a peak height of 2.70m at the summit of the gently sloping apex roof. For such a large, well built and visually appealing cabin we would have expected to pay upwards of three thousand pounds as well, so it also represents good value for money, particularly with a 10 year anti-rot guarantee included as well. This is certainly one of the reasons it earns a place in the upper half of our league table, but we found a lot more to like about it as well. One of the great advantages that these wooden cabins have over some of their rivals is that they have an overhanging roof that acts as a canopy over a wooden verandah. This covered area will be an ideal place to share drinks with guests either before or after a dinner party, or even to use as the location for a barbecue. We were also pleased to see that the double doors come with a secure key operated lock, and with an opening width of 1.55m and a height of 1.75 it’s easy to move furniture in and out, which can transform these cabins into a truly luxurious place to pass the hours. 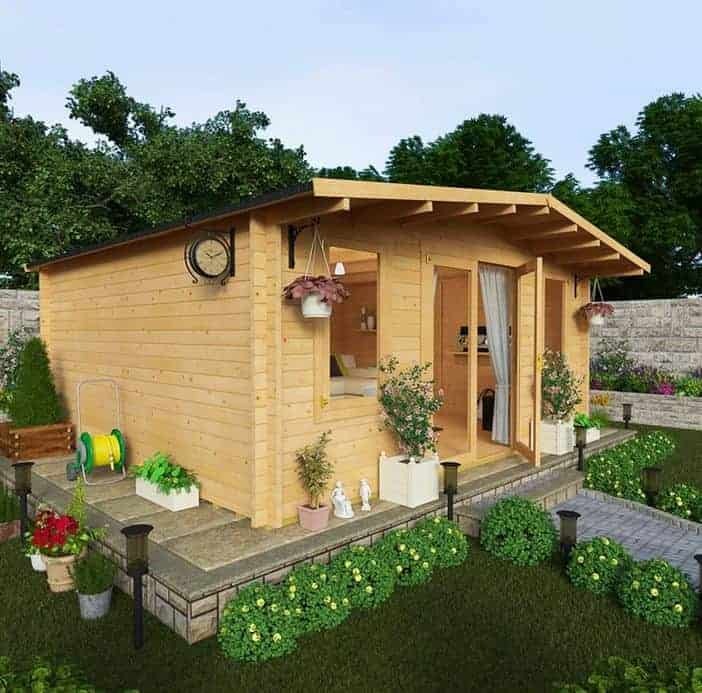 Wooden cabins make an ideal complement to just about any garden, but what do you do if your particular garden is a little too compact, or you just don’t want to give up any more of your precious lawn space. Thankfully Rowlinson have come up with an answer that impressed us so much we had no hesitation in placing it in the top ten of our league table. What makes this different from the log cabins above it in our guide is that it has a five sided design which allows it to be tucked away neatly into the corner of most gardens. 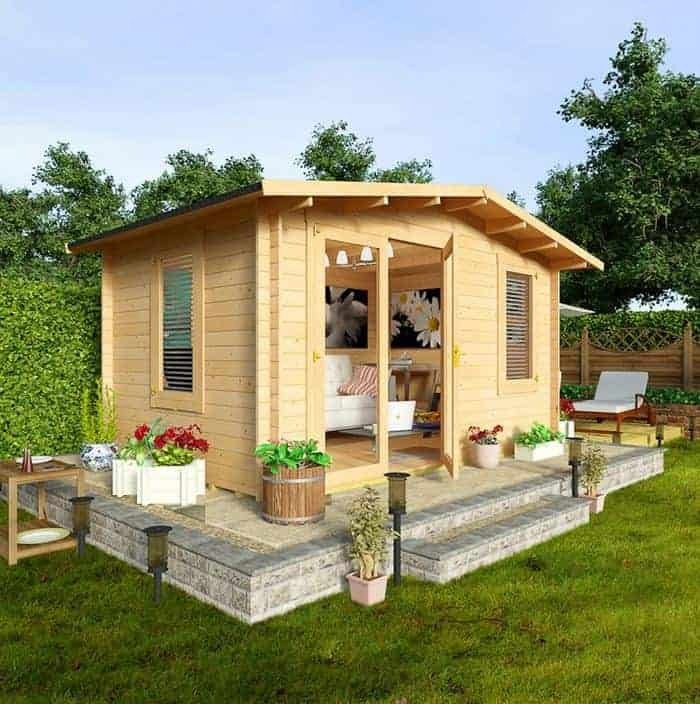 It means that even if you have a small to medium garden, you can still enjoy a well built cabin with an accommodating base area of 3.25 x 3.25m, although of course some of this space is lost because of the corners. We found the style of these wooden cabins to be not only original and yet practical, but also very attractive as well, and we were particularly impressed by the shingle covered roof that caught our eye from the moment we saw it. We were also pleased to see that the timbers were protected by a ten year guarantee, and with all these positive features we were pleasantly surprised to find that it came with an asking price of less than two thousand pounds. 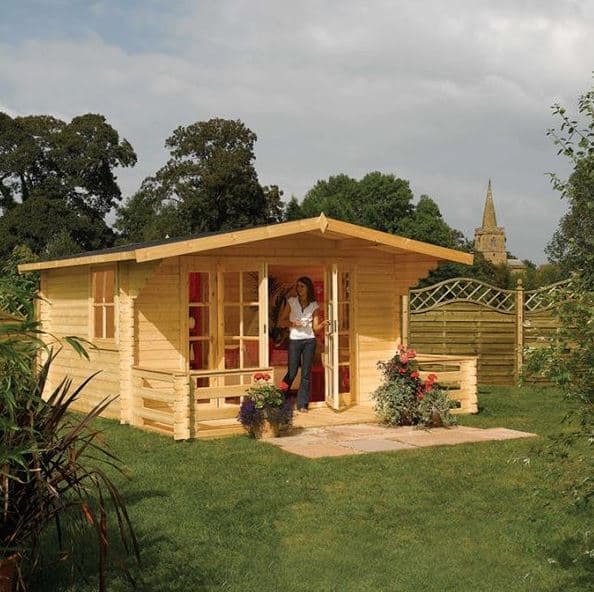 These generously proportioned wooden cabins are ideal for people who have narrower gardens, as the depth of 5.90m is considerably more than their depth of 3.85m. They also have a very striking appearance, and we were once again pleased to find that the building has a highly useful porch area built into it. We were also glad to find that it comes with a 10 year anti-rot guarantee from the manufacturer, even though, as with all but one of the extended warranties to feature in this league table, it is dependent upon the owner adding regular wood preserver treatments. There are lots of windows positioned around three of the four sides, and the double doors are glazed as well. This makes the interior of these wooden cabins very well illuminated on sunny days, which makes them an excellent environment to work within. What impressed us most about the windows, however, was not their size or number but the fact that they feature toughened glass. This makes them virtually unbreakable, which can be an important safety feature if you have small children playing in or around the cabin. It also helps to protect the cabin from attempted break ins, which is also an important consideration today. These large wooden cabins have a real look of luxury about them, being styled very much in the fashion of a traditional house, with centrally positioned double doors leading to a porch area, and an apex roof above that reaches up to a height of 2.50m. Once inside it will likely feel as roomy as some houses as well, with its depth of 4.19m and width of 7.89m, which is by far the widest of any of the wooden cabins to feature in our league table. As you might expect, such large and well built wooden cabins also come with a rather large asking price. These are in fact the most expensive of all the cabins to gain a place in our top twenty list; this has been taken into consideration when determining its ranking, but if you don’t mind spending over five and a half thousand pounds on a garden building of real quality then you may want to move this towards the summit of your own personal shortlist. Such is the quality of these cabins, as demonstrated by the use of toughened glass for all the windows, that they may well become an investment for the future, and we feel that they’ll certainly become a much loved garden feature for anyone who buys one. We always like to see well built wooden cabins that have an overhanging roof or canopy at the front. After all, it can be hard to predict what our weather will do from one hour to the next, and yet this provides an oft needed sheltered area from either rain or the hot sun. It’s a feature that this Haven cabin from Waltons excels in, as the overhanging roof projects further than we’ve seen on any other wooden cabins of a similar size that we’ve reviewed. 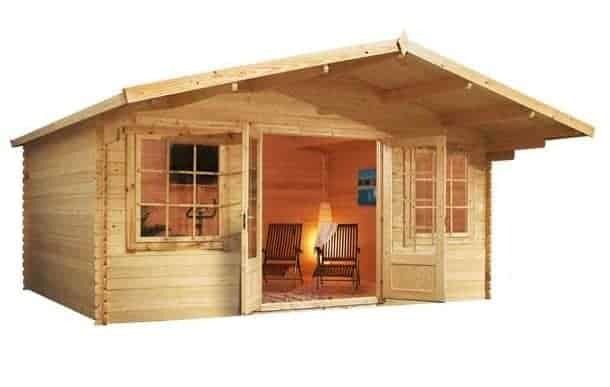 It’s not only practical, it’s very striking too and will make your log cabin stand out from any that your friends or neighbours may have. 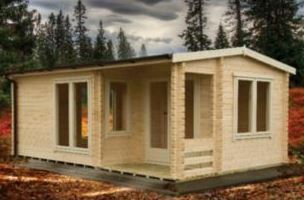 For its size and build quality, with strong 44mm thick timber logs being used for the interlocking cladding and a 19mm tongue and groove roof and floor, we also feel that these wooden cabins offer reasonable value for money, with their asking price of less than three thousand pounds for a cabin with a base area of five metres squared. This value is added to still further with the inclusion of a 10 year manufacturer’s warranty, and that can also add peace of mind for customers who are making what is after all a sizeable investment in their garden. Logs are an ideal substrate for wooden cabins, as demonstrated by this Bern cabin that uses 28mm thick interlocking logs. Once assembled it feels very strong and stable, and because the logs fit tightly together there is no room for rainwater to find its way inside. Of course, logs can be a great source of energy too, and one reason this particular wooden cabin scores so highly is that it has an integrated log store at the side. We occasionally see this among the best sheds that we review, but it’s unique among the wooden cabins we see, and it’s such a useful feature that it earns the building as a whole a place in our top twenty league table. The store is open to the elements, which is needed to provide optimal conditions for logs stored there, but is protected by the overhanging roof. It’s a smart addition, and we felt it also added to the visual appeal. 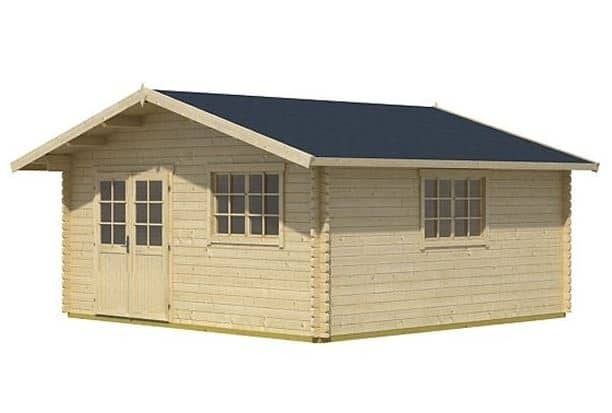 With a base area of 2.98 x 1.98m this isn’t one of the larger wooden cabins in our league table, but this means that it should fit nicely into a medium sized garden, or even a relatively compact one. There are lots of optional extras available at the time of purchase, from window boxes to shutters and a firewood bunker. This is something we always welcome, and it means the owner can have a custom cabin just the way they want it. 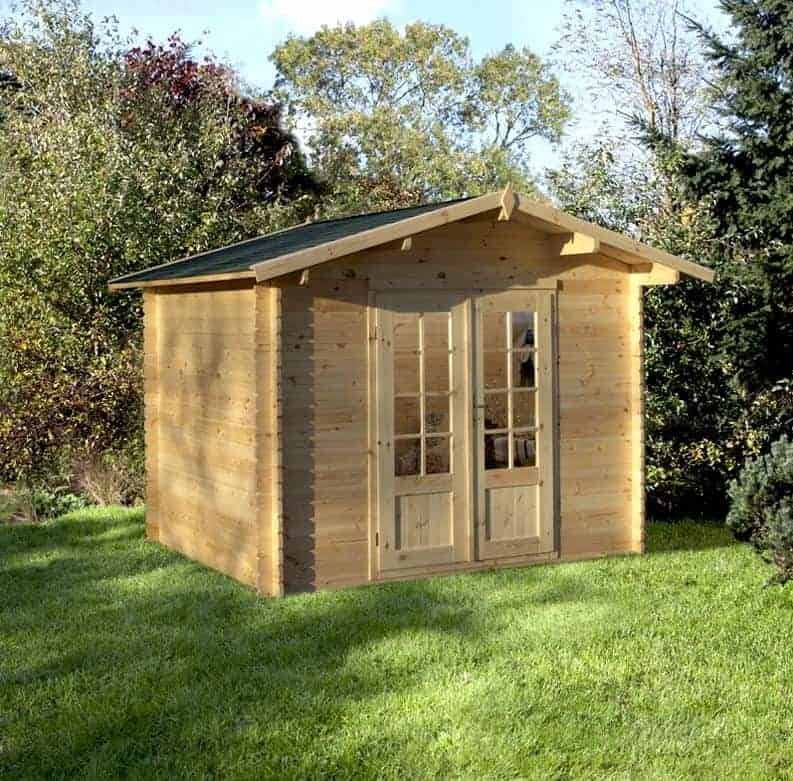 With a base area of 5.22 x 5.03m, these are among the largest wooden cabins in our league table, and that makes them a very versatile garden building. There’s more than enough room inside for these to be used as an extension to the house itself, although of course planning permission may be required. We think, with the addition of some furniture and maybe some electrical equipment, they could make ideal guest quarters, and we can also imagine them being converted into a home study or office. 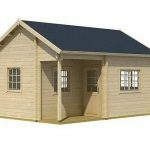 The scale of these apex roofed wooden cabins was the first thing that caught our eye, but we were pleased to find that they still demonstrated the quality and attention to detail that we’ve come to associate with the BillyOh garden buildings we’ve reviewed. What impressed most of all, considering the spacious interior on offer, was the asking price of less than two thousand pounds. 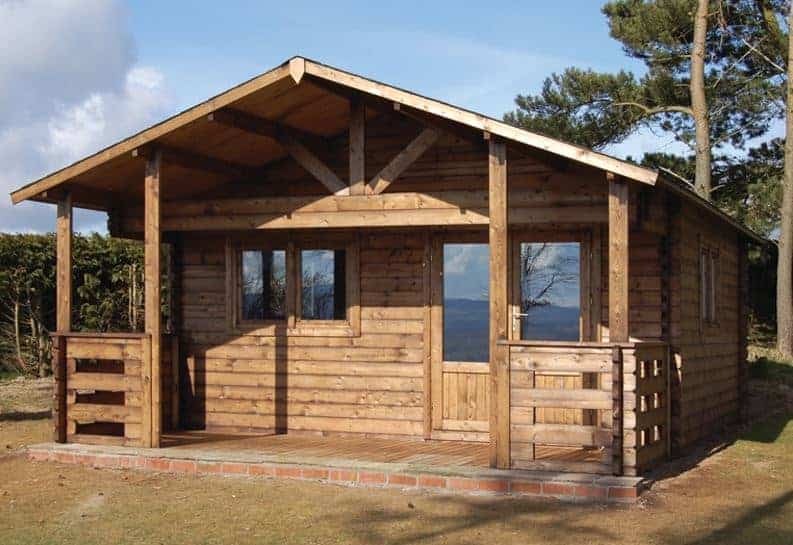 Whilst an extended warranty period would have added even more value for money, and earned this cabin a place towards the top of our league table, it’s still among the best value log cabins we’ve reviewed. 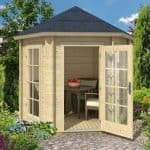 If you want a big, sturdy building for your garden on a small budget, then this could be just what you’re looking for. 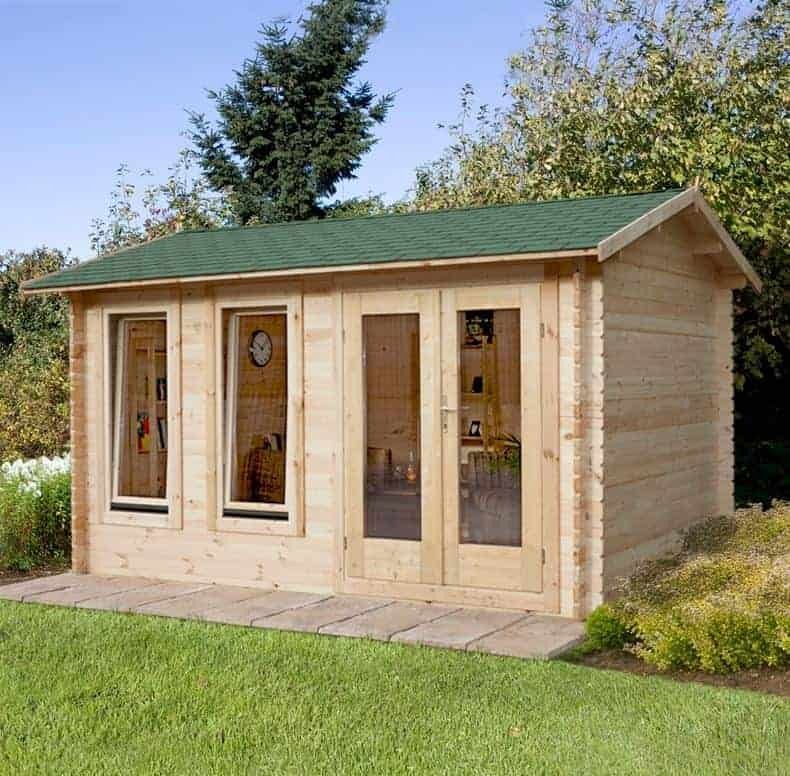 This is another corner style log cabin, and this offers an even larger base area of 4.32 x 2.96m than the Rowlinson Kestrel wooden cabins that featured earlier in our table. On this occasion, however, there is no extended warranty included as well, which accounts for their relative positions within our guide. If you want a larger cabin to work or relax in, and yet are worried that you might not have quite enough lawn space available to accommodate one, then this could be a great solution, and we certainly feel that it represents very good value for money with its price tag of less than twenty three hundred pounds. This is one of the most eye catching corner wooden cabins that we’ve seen, and it reminded us of a Swiss chalet. This is partly due to the use of chalet connections, which is a feature we always like to see as they can make a big difference to the strength and stability of the cabin. We were also very impressed by the shingled roof; it’s sure to attract admiring glances from neighbours and friends, and yet it also performs excellently when it comes to keeping precipitation out, and the contents within dry and warm. 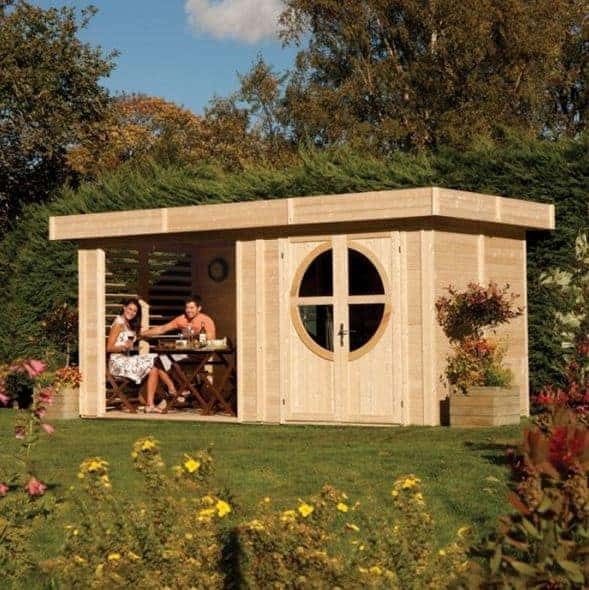 If you’ve ever holidayed in the Alps and fallen in love with the high class chalets that they have over there, you can recreate that look faithfully in you garden thanks to these very stylish wooden cabins from Solid. 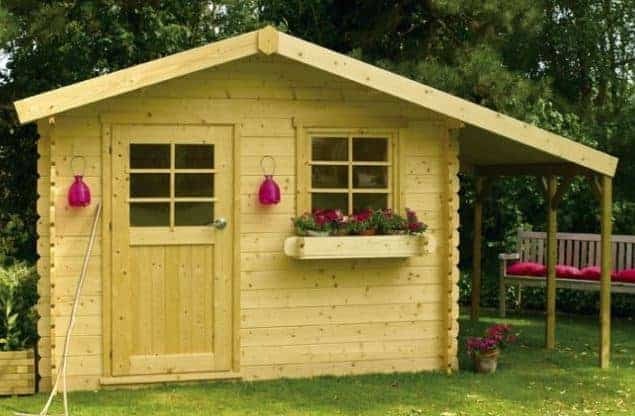 With dimensions of 5.08 x 3.28m there’s more than enough room inside to use it for either storage or leisure purposes, and once assembled it should feel strong and stable, so you won’t have to worry if your garden’s situated in an exposed area that often has strong winds. We were pleased to find lots of light inside as well, thanks to the two windows on either side of the half glazed double doors, and we were glad to find that the windows could be opened as well to allow ventilation in. As well as the spacious interior that these wooden cabins offer, there’s also an outdoor porch area with a depth of 0.60m, thanks to the overhanging canopy of the roof. That makes this an ideal place to entertain dinner guests as you look out at the garden. What we particularly liked was the ability to add a wide range of extras. Whether you want to add garden boxes, or maybe put shutters over the window, or add a floor or either a single or double annexe, this can all be added at the point of purchase. If you’re a sun lover, then these wooden cabins could be an ideal buy. That’s because they offer the shaded interior that we all need from time to time, and yet have a largely glazed frontage that fills the area with natural light and keeps it pleasantly warm at most times of the year. It was this glazing that first caught our eye, with set of fully glazed double doors at the right hand side of the building and then two long windows adjacent to them. With so much glass on display it can soon become very warm in summer, so we’re pleased to see that both these windows can be opened via a tilt and turn mechanism. Another thing that we found impressive about these wooden cabins was just how strong they are, especially considering the highly affordable asking price of not much more than two thousand pounds. The 34mm interlocking log cladding is a little thicker than the 28mm logs that we often see, and the difference should really be noticed once the cabin has been installed. It’s also possible to add underfloor heating and insulation, which we feel is a very neat touch as it allows the cabin to be used all year round even in our ever unpredictable British climate. These Montana wooden cabins from BillyOh earn their place in our top twenty league table thanks to the outstanding value for money they offer, especially when the tough and high quality components we found used are taken into account. With a width of 4.08m, a depth of 2.92m and a peak height at the top of the rain deflecting apex roof of 2.47m, we would have expected an asking price far in excess of the one on show here. 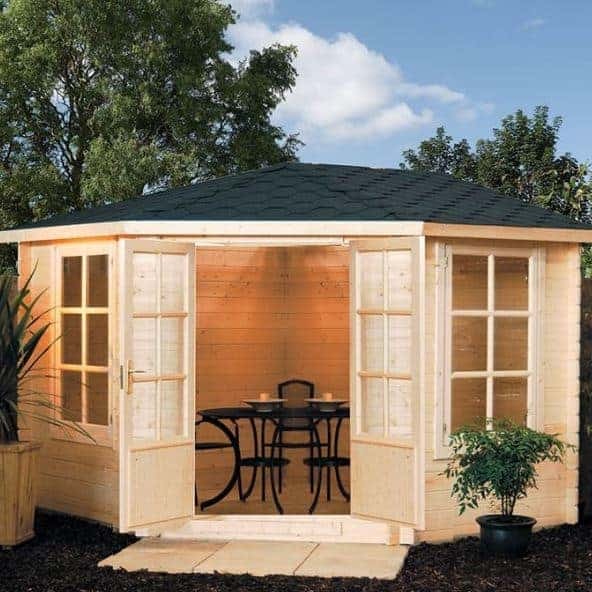 That makes this ideal for consumers operating on a restricted budget, and we were glad to find that even at this bargain price there have been no corners cut with the log cabin itself. The double doors on these wooden cabins caught our eye from the moment we saw them, being placed at the far side of the cabin. They’re fully glazed, and we were pleased to find that there are two more windows as well; one adjacent to the doors and one on a side panel. This means that natural light reaches into every corner, which we feel is essential if you want to use the cabin as an office in the garden, a role for which we feel it’s ideally suited. This is one of the most compact wooden cabins in our WhatShed league table, and it has a classic design that won’t win any prizes for originality but that we know many people will like. 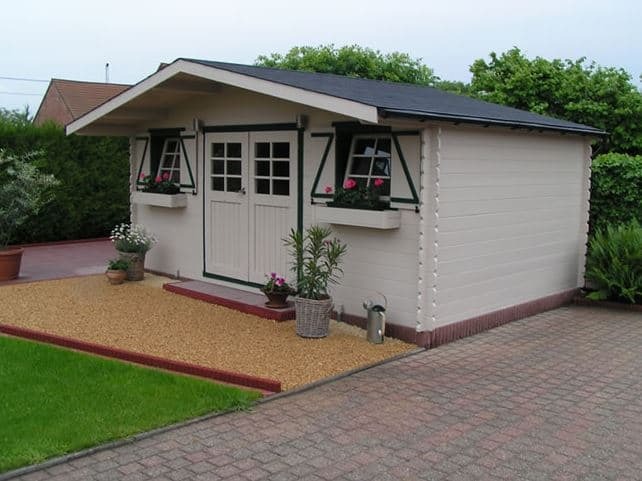 With a base area of 3.00 x 2.50m, this has the appearance of a large garden shed, with the felt covered apex roof overhead helping to keep rainwater out. What differentiates this, however, is the 28m log cladding rather than standard tongue and groove timber. 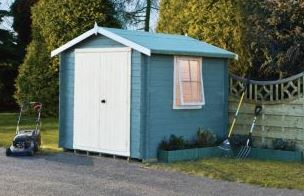 It gives added strength and durability, and yet on this occasion it comes with a good value price tag that we can readily imagine being applied to sheds of similar sizes. The centrally positioned double doors make it easy to move furniture in and out of these wooden cabins, and even though there are many bigger cabins in this top twenty, this one is still spacious and welcoming. With the addition of a sofa or chair, this could become an ideal place in which to sit and relax at the end of the day, or it could be used as an auxiliary dining room. Another feature we liked was the overhanging canopy which extends for another half metre. This provides a very useful shaded area which helps to cool down the cabin itself on hotter days, as well as providing a sheltered outdoor area on a rainy day. These wooden cabins are among the largest to gain a place in this league table, with base dimensions of 5.80 x 5.00m, and a ridge height of 2.40m. 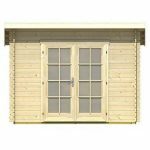 This makes them suitable for people who want a cabin not only for leisure purposes, or even for garden storage purposes, but also for business purposes. The wide opening double doors, with a width of 1.56m, make it easy to move large or bulky items in and out, so this could include office furniture or even machinery. We can even imagine this being used as a workshop, and it’s certainly more stylish and elegant than most workshops that we review. Whatever you use these wooden cabins for, you’ll be pleased to find, as we were, that the two large windows can be opened for ventilation purposes. They’re also cross hatched in a Georgian style, as is the glazing on the doors. This adds to the visual appeal of what are already among the most attractive large log cabins that we’ve reviewed. If an extended warranty had been included as well, and if the asking price had been a little lower, then this Dorchester cabin could have gained a much higher rank rather than being in the penultimate position. As the name suggests, these large five metre by five metre wooden cabins have more than a touch of the south of France about them. 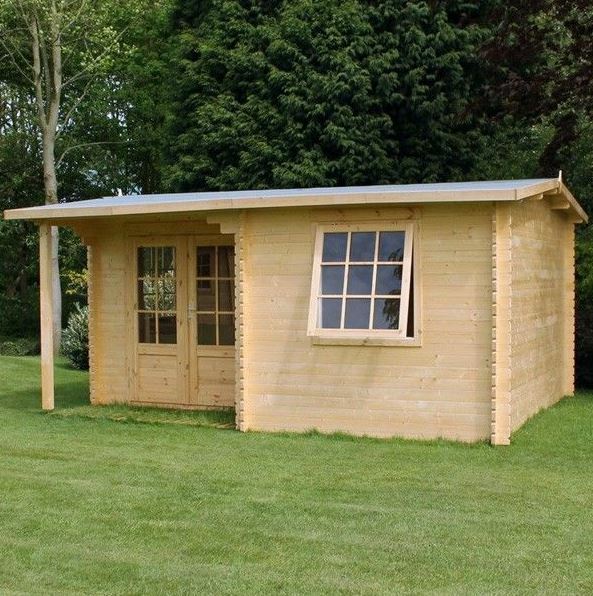 This rustic charm combines with very high quality components, as epitomised by the use of smooth planed 44mm logs, to create a stunning garden building. It also brings with it a price of almost five and a half thousand pounds however; we know this will put some people off buying it, which is the reason it finds itself at the foot of our WhatShed league table, but if you have a budget that will stretch to this price then it certainly deserves a closer look. It has a style that we’ve not seen replicated in other wooden cabins, thanks to the long overhanging canopy roof that isn’t free standing but rather leads to support posts that form the perimeter of a verandah area. It also features three large tilt and turn windows, so inside should be light, airy and welcoming. The final touch of elegance is given by the use of shingle roof tiles, which create a stylish look as well as ensuring that this should be a very durable and weather proof garden building.